Epic tells Wisconsin utility regulators that its expected peak demand usage of electricity will double in the next 10 years, placing the company among the state’s top electricity users that are otherwise mostly manufacturing plants. That’s in addition to its extensive use of solar, wind, and geothermal energy. 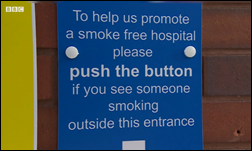 A hospital in England installs wall-mounted buttons near its doors that can be pushed by people who notice someone smoking their despite clearly visible “no smoking” signs. The buttons trigger the playing of a recorded announcement over a loudspeaker, with a child’s voice asking them nicely to stop using terms such as, “Someone’s mummy or daddy could be having their treatment today.” A pro-smoking group (who knew?) calls the system “Orwellian” and says a better idea would be to move the smoking area further away, but not so far that less-mobile smokers can’t reach it easily. That sounds great on paper, but as many of us have observed first hand, is a lot harder than it sounds, especially evenings and nights when patients, visitors, and employees are illuminated only by the glow of their cigarettes as darkness encourages them to choose personal convenience over posted rules. I was interested that the BBC announcement referred to “tannoy,” which is apparently like Kleenex having turned a company name (in this case, a loudspeaker manufacturer) into a common noun. An Atlanta radiologist who made a fortune from his medical device patents is sentenced to six months in prison for a $2 million tax fraud scheme in which he claimed to be a minister who had taken a vow of poverty. Michael Jon Kell, MD made up a church, named himself as pastor, and placed all his assets in church accounts from which he funded vacations, private school tuition for his kids, online dating services, and ownership of his lavish mansion. In England, the BBC notes that Member of Parliament Dan Poulter is working 28 hours per week at a side job – in his case, as a doctor taking psychiatric training – than any other member. The article also notes that his voting record is among the lowest of Conservative members. A shoeshine man who worked from the halls of UPMC Children’s Hospital of Pittsburgh died this week at 76, having donated all of his tips since 1982 – over $200,000 — to the hospital’s Free Care Fund.